The 1853 'Recommendations of Circular On The Subject Of Coast Batteries' laid down that the ammunition for coast batteries be made up into cartridges and that these cartridges be kept in metal-lined cases. It stated that it was also desirable to have one barrel of loose powder per gun with a proportionate number of flannel charges. Magazine accommodation was to be provided to store 200 rounds per gun. Bomb proof shell filling rooms were to be provided in the ratio of one to every six guns. These were to be contiguous to the magazines. Where this was not possible expense magazines to hold three cases per gun had to be provided. One cartridge store and one shell store for every two guns were recommended by the 'Memorandum On The Modifications Rendered Necessary In Batteries By Recent Improvements In Artillery‘. (Appendix no.3 to the 1869 report.) The number of rounds per gun stored in basement stores was set at 100. 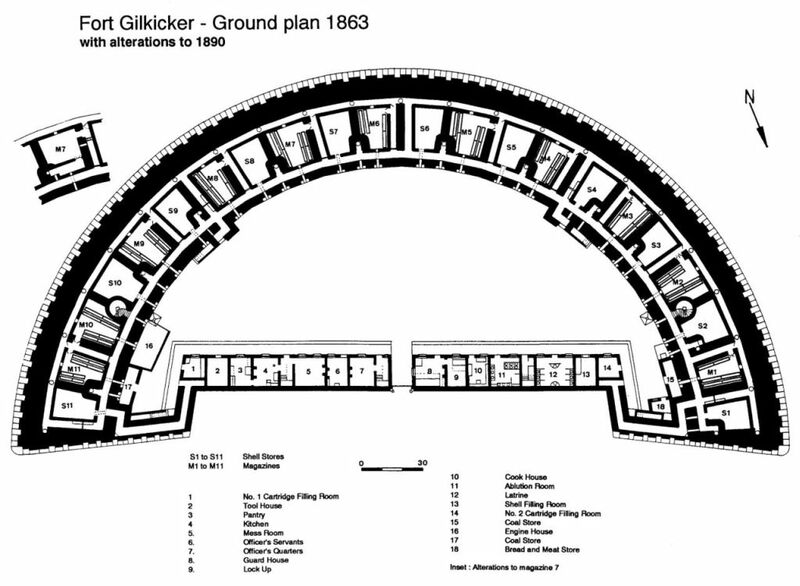 At Gilkicker these recommendations were taken into consideration. Under the casemates, in a basement forming a lower storey, were constructed the ammunition stores. This basement was divided into a number of separate chambers corresponding to the casemates above and allotted alternately for the storage of shell and cartridge. There were 11 shell stores and 11 magazines. The magazines held between 203 and 317 barrels of black powder with 100 pounds per barrel. Passages ran the whole length of the battery, in front of and to the rear of these chambers, separated from them by walls. At either end of the shell passage, where it met the gorge wall, a tunnel ran under the balcony adjacent to the rear wall of the fort. It emerged in a lobby under the end of the barrack. Access from the parade to the magazines was in two places through doorways under the stairs which led from the parade to the gun floors. Two spiral stairs led from the gun floors to the magazines emerging in the shell passage below casemates numbers 3 and 20. The front, or powder passage, was three feet wide whilst the rear, or shell passage, was three feet six inches wide. At either end of the basement and opposite each entrance from the parade, cross passages connected the shell passage with the powder passage. The shell stores and the powder magazines were filled in the first instance from the shell passage, into which the shell stores opened by a doorway direct. Doors from the shell passage opened into lobbies, or short passages, separated from the cartridge stores themselves by a thin brick partition. At the far end of each lobby a door gave access to the magazine. The end of the lobby had a powder hatch with sliding shutter, through which the cartridges were passed from the lobby into the powder passage. From the powder passage were built vertical powder lifts to the casemates above. Recesses in the shell passage contained vertical shell lifts, two feet in diameter, cut into the piers and emerging from them on the gun floor towards the rear of the casemates. Four of these shell lifts continued up to the upper battery on the roof. (The 'Memorandum‘ stated that one shell lift for each gun and about two cartridge lifts for three guns were to be provided, the place of the third lift being occupied by the lamp for lighting the powder passage.) There were seventeen cartridge lifts and eleven shell lifts but by 1890 some of the cartridge lifts had been converted to lamp housings. The lifts for both the cartridges and the shells were thirteen feet in height, measured from floor to floor. Speaking tubes at each lift enabled the gun detachments to communicate with the men in the passages beneath. The lighting in the powder passage was provided by lamps passed down through apertures in york stone slabs set in the floor above. The shell passage, shell stores and cartridge stores were illuminated by lamps passed through tunnels from the outside of the casemates at parade level. Iron doors, which were clad with wood on the inside, closed them off when the lamps had been inserted. The earlier light boxes in the floor of the veranda which illuminated the shell passage were covered over but the york stone slabs remained. The Committee was of the opinion that such expense was unnecessary. ..this precaution is in excess of what is necessary to guard against accident, as we (the committee) see no objection to the lamps when lighted and with their doors closed being carried along the shell passage, deposited directly in lamp closets, made for their reception, and there shut up before the shell stores or magazines are opened for the service of the guns.‘ This would, in the opinion of the committee, not be objectionable as powder would not be carried along this passage except when the magazine was being filled and the battery not in action. They stated that it could be no more dangerous than running a truck, with iron wheels, along it laden with a heavy shell. They remarked that the arrangements for lighting were perfectly secure, and where candle lamps were used with candles having three wicks, the light was ample. The employment of candles was preferred as a safeguard as they needed no trimming. Despite the objections the work was carried out. Fort Gilkicker: Plan of Magazines 1863.